The Lincoln National Forest will begin selling Christmas Tree permits Monday, Nov. 13, for $10 each – only one per household. A limited number of permits will be available to be sold on a first-come first-served basis. An individual may purchase up to four permits for four separate households. The last day to purchase a permit is Dec. 22 while offices are open and permits are available. With a permit, a tree may be cut from most areas within the Lincoln National Forest, except from a “wilderness” or designated “closed” area. When purchasing your permit and filling out the application, you will be asked to identify the area that you plan to harvest your tree from. To learn more about the types of trees in the area, view our guide, “Common Tree Types” to help you with your choice. The guide is also available on our website at: www.fs.usda.gov/lincoln. Please be good stewards and make sure that your Christmas tree is harvested only from US Forest Service lands, as shown on the map that accompanies the permit. 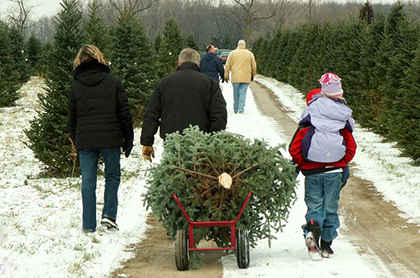 Remember, the last day to cut a tree is December 25th. For more information contact the Lincoln National Forest at 575-434-7200 or visit www.fs.usda.gov/lincoln.